Newsroom Home / NJAES Program Areas / Commercial Agriculture / Silicon: An Essential Plant Nutrient? Silicon: An Essential Plant Nutrient? Share the post "Silicon: An Essential Plant Nutrient?" Silicon—we think of it in sand and as an abundant element like oxygen or aluminum in soils. In New Jersey, with beaches and sandy soil everywhere around us, how could silicon be an essential plant “nutrient,” in short supply? Joe Heckman taking samples from research plot of winter wheat. It turns out, not all silicon is soluble and available to crops. 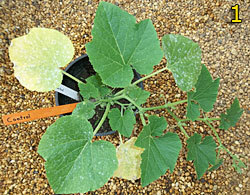 When applied to certain crops like cucumbers and squash in a soluble form, this silicon “fertilizer” results in crops showing natural resistance to powdery mildew disease. In 1999, the first International Conference on Silicon in Agriculture was held in Florida. It was organized by Professor of Plant Pathology Dr. Lawrence Datnoff, with the objective of bringing together scientists from around the world involved in the study of silicon nutrition. Joseph Heckman, extension specialist in soil fertility at Rutgers New Jersey Agricultural Experiment Station attended that inaugural conference and came away determined to investigate the role silicon nutrition plays in the suppression of powdery mildew disease. 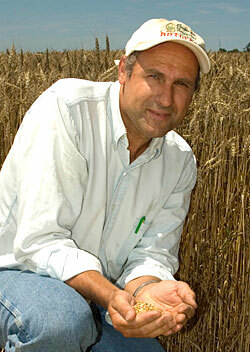 In 2000, he began field research at Rutgers on silicon nutrition of crops and soils. 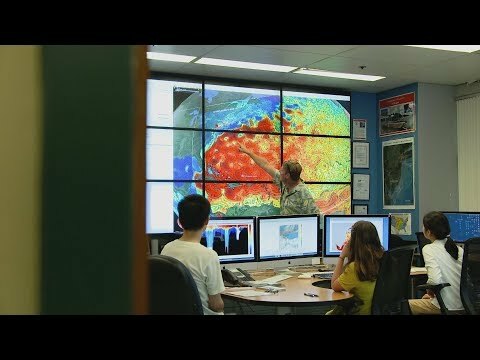 Prior to Heckman’s efforts, the majority of the silicon studies were conducted on tropical soils and on crops such as sugarcane and rice. Heckman’s research plots at Rutgers Snyder Research and Extension Farm in Pittstown, NJ, were selected based on pH so that the silicon could be applied as a liming material—calcium silicate. This liming material, a cleaned byproduct of steel processing, provides the same calcium carbonate equivalent as the standard liming material, calcium carbonate, but with the added benefit of providing available silicon. Heckman’s research trials involved a rotation of crops over a number of years using calcium silicate limed plots and calcium carbonate limed plots as controls. 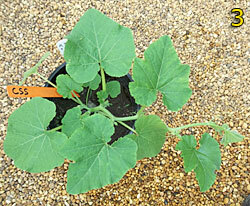 The first trial examined pumpkin and its resistance to powdery mildew disease. This was followed by trials on field corn, oats, winter wheat, red clover, orchard grass hay, and cabbage. 1: Pumpkin plant growing in untreated soil exhibiting symptoms of powdery mildew disease. 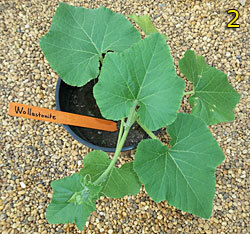 2: A healthy pumpkin plant growing in soil amended with, Wollastinite, a naturally occurring mineral source of silicon. 3: A healthy pumpkin plant growing in soil amended with a commercial silicon fertilizer. According to Heckman, field trials using calcium silicate indicate that enhanced levels of silicon uptake can provide additional crop benefits beyond its use as a liming material. While powdery mildew disease in pumpkin fruit and wheat grain was suppressed, in some years Heckman found that yields were also increased on the plots in which calcium silicate was added. He also found that corn plants grown on soil previously amended with calcium silicate had less stem damage from European corn borer. Yields of forage grains improved equally whether limed with calcium carbonate or calcium silicate. While cabbage yields were improved overall from liming, the addition of calcium silicate did increase the yields of marketable heads more than calcium carbonate. The benefits of residual calcium silicate applications were still evident in crops produced three to four years after the last application. For details and results of Heckman’s silicon trials, see the Soil Profile newsletter (PDF). Following more than a decade of work on silicon soil fertility and nutrition research in New Jersey, there was vindication for Heckman’s hard work. In 2011, the Association of American Plant Food Control Officials designated silicon as a “plant beneficial substance.” This designation followed presentation of research findings by Heckman and others at the fifth International Conference on Silicon in Agriculture in Beijing, China. Testimony too to the recognition of the importance of silicon to healthy growth, plant available Si may now be listed in the “guaranteed analysis” section on fertilizer labels. There is more ground to cover on the impact of silicon on agricultural crops. Heckman, who may be the only soil scientist among a handful of plant pathologists doing research on silicon, continues to explore its role and availability in soil. “If we can grow healthier plants by optimizing soil fertility using silicon and other nutrients, we can minimize the need for pesticides,” says Heckman. On October 24, 2012, Heckman and silicon researchers from around the world presented their research at the Soil Science Society of America symposium on “Silicon Soil Fertility and Nutrient Management” held at the annual American Society of Agronomy – Crop Science Society of America international meetings in Cincinnati, OH.